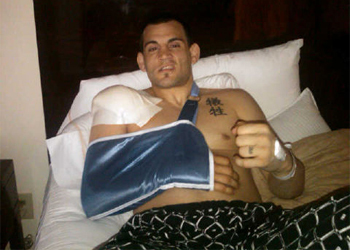 UFC welterweight Jon Fitch underwent successful shoulder surgery earlier this month. With a lengthy four to six month rehab staring him dead in his eyes, Fitch realizes he suddenly has an abundance of free time on his hands. To ensure his fans have the latest updates regarding his return, the 33-year-old has launched a YouTube series entitled “Road to Recovery.” The first installment shows Fitch preparing to go under the knife in Los Angeles, California. Before getting stung by the injury bug, Fitch was slated to headline UFC 132 opposite BJ Penn. The 170-pounders fought to a highly controversial (29-28 Fitch, 28-28, 28-28) majority draw in their top contender bout at UFC 127.